Looks like the media speculation that the Cubs would need to find a new color analyst for their TV broadcast team is now moot. The AP is reporting Milwaukee Brewers GM Doug Melvin has chosen Ken Macha over Bob Brenly and Willie Randolph. Both Mark Grace and Rick Sutcliffe were names tossed about (unofficially) to sit beside Len Kasper in the Cubs TV booth if Brenly were hired as manager of the Brew Crew. Seems like Brenly has interviewed for every open manager position in the majors over the past few years. I wonder why a former World Series winning manager can’t seem to get re-hired? 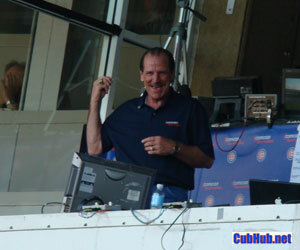 Thats fine for most Cub fans as he has proven to be a fairly popular broadcaster. The Cubs should trade three or four players for Peavy, probably two field players and two pitchers. Here are some players I think the Cubs could trade –Ronny Cedeno, Felix Pie, Jake Fox, Koyie Hill, Sean Marshall, Jason Marquis, Rich Hill (if he gets his control back this winter), and Michael Wuertz. Marshall, Pie, and Cedeno would be the players that the Padres would be the most interested in. There may also be some minor league players that I am not aware of that the Padres might be interested in.